The Colorado Avalanche Hockey Club announced today that the team has acquired forward Jordan Caron and a sixth-round selection in the 2016 NHL Draft from the Boston Bruins in exchange for forwards Paul Carey and Maxime Talbot. Caron, 24, was Boston’s first-round pick (25th overall) in the 2009 Entry Draft. He has skated in 11 games for the Bruins this season (0g/0a) while also playing 23 games for the Providence Bruins of the American Hockey League (9g/10a). 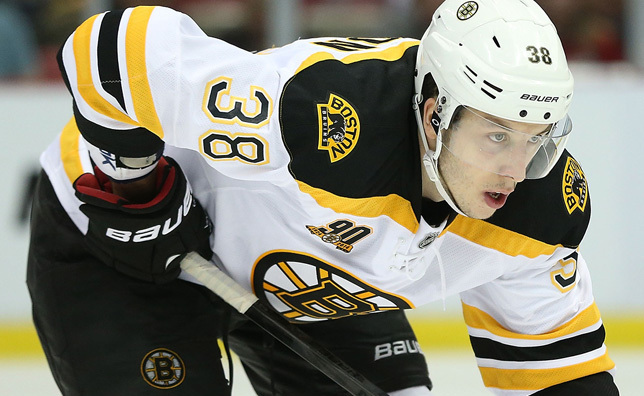 The Sayabec, Quebec native has appeared in 134 career NHL games, all with the Bruins, tallying 28 points (12g/16a). The 6-foot-3, 204-pound right wing has also seen action in nine NHL playoff games, scoring one goal. In addition, the Avalanche also announced today that the team has acquired forward Freddie Hamilton from the San Jose Sharks in exchange for defenseman Karl Stollery, and acquired defenseman Mat Clark from the Anaheim Ducks in exchange for forward Michael Sgarbossa. Both Hamilton and Clark will report to the Lake Erie Monsters (AHL).